“Dennō Senshi Porygon” ( Dennō Senshi Porigon?, literally “Computer Soldier Porygon”, although most commonly known as “Electric Soldier Porygon”) is the thirty-eighth episode of the Pokémon anime’s first season. Its only broadcast was in Japan on December 16, 1997. In the episode, Ash and his friends find at the local Pokémon Center that there is something wrong with the Poké Ball transmitting device. To find out what’s wrong, they must go inside the machine. The episode is infamous for using visual effects that caused seizures in a substantial number of Japanese viewers, an incident referred to as the “Pokémon Shock” ( Pokémon Shokku?) by the Japanese press. Six hundred and eighty-five viewers were taken to hospitals; two people remained hospitalized for more than two weeks. Due to this, the episode has not been rebroadcast worldwide. After the shock, the Pokémon anime went into a four-month hiatus, and it returned on TV Tokyo in April 1998. Since then, the episode has been parodied and referenced in cultural media, including The Simpsons and South Park. Ash, Misty, Brock, and Pikachu discover that the system used to transfer Pokémon from one Pokémon Center to the other is malfunctioning. On Nurse Joy’s request, they go to Professor Akihabara, the one who created the Poké Ball transfer system. He tells them that Team Rocket stole his prototype Porygon, a digital Pokémon that can exist in cyberspace, and is using it to steal trainers’ Pokémon from inside the computer system. Akihabara sends Ash, Misty, Brock, Pikachu, and his second Porygon into the system to stop Team Rocket, whom they learn have set up a blockade that stops Pokéballs from traveling the network. Porygon is able to defeat Team Rocket’s Porygon, but Nurse Joy, monitoring the situation, has sent an anti-virus program into the system to combat what she thinks is a computer virus. 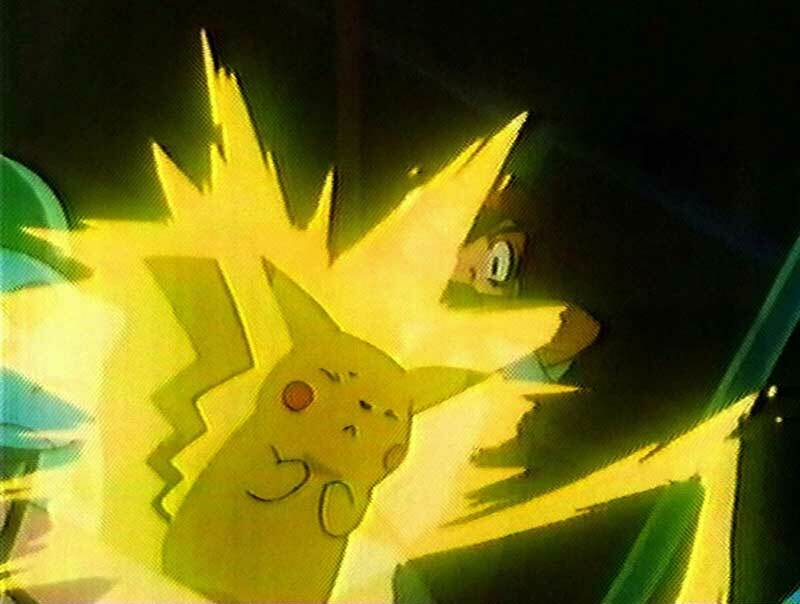 Pikachu uses a Thunderbolt attack on the program, which manifests as “vaccine missiles”, which causes an explosion. The group and Team Rocket successfully escape the computer, and with Team Rocket’s blockade removed, the system returns to normal. “Dennō Senshi Porygon” aired in Japan on December 16, 1997 at 6:30 PM Japan Standard Time. The episode, which was broadcast over thirty-seven TV stations that Tuesday night, held the highest ratings for its time slot, and was watched by approximately 26.9 million households. Twenty minutes into the episode, there is a scene in which Pikachu stops vaccine missiles with its Thunderbolt attack, resulting in a huge explosion that flashes red and blue lights. Although there were similar parts in the episode with red and blue flashes, an anime technique called “paka paka” made this scene extremely intense, for these flashes were extremely bright strobe lights, with blinks at a rate of about 12 Hz for approximately six seconds. At this point, viewers started to complain of blurred vision, headaches, dizziness and nausea. Some experienced seizures, blindness, convulsions and loss of consciousness. Japan’s Fire Defense Agency reported that a total of 685 viewers – 310 boys and 375 girls – were taken to hospitals by ambulances. Although many victims recovered during the ambulance trip, more than 150 of them were admitted to hospitals. Two people remained hospitalized for more than two weeks. Some other people had seizures when parts of the scene were rebroadcast during news reports on the seizures. Only a small fraction of the 685 children treated were diagnosed with photosensitive epilepsy. Later studies showed that 5–10% of the viewers had mild symptoms that did not need hospital treatment. 12,000 children who did not get sent to hospital by ambulance reported mild symptoms of illness; however, their symptoms more closely resembled mass hysteria than a grand mal seizure. A study following 103 patients over three years after the event found that most of them had no further seizures. Scientists believe that the flashing lights triggered photosensitive seizures in which visual stimuli such as flashing lights can cause altered consciousness. Although approximately 1 in 4,000 people are susceptible to these types of seizures, the number of people affected by this Pokémon episode was unprecedented. An article in USA Today reassured parents that “American children aren’t likely to suffer seizures provoked by TV cartoons”, because U.S. networks “don’t air the graphic Japanese cartoons known as ‘anime'” with their “fast-paced style of animation”, although anime has become more prevalent on American television since then. The incident, which was referred to as the “Pokémon Shock” ( Pokemon Shokku?) by the Japanese press, was included in the 2004 edition and the 2008 Gamer’s Edition of the Guinness World Records book, with the dubious honor of holding the record for “Most Photosensitive Epileptic Seizures Caused by a Television Show”. News of the incident spread quickly through Japan. The following day the television station that had aired the episode, TV Tokyo, issued an apology to the Japanese people, suspended the program, and said it would investigate the cause of the seizures. Officers from Atago Police Station were ordered by the National Police Agency to question the anime’s producers about the show’s contents and production process. An emergency meeting was held by the Ministry of Health, Labour and Welfare, in which the case was discussed with experts and information collected from hospitals. Video retailers all over Japan removed the Pokémon anime from their rental shelves. Reaction was swift on the Tokyo Stock Exchange, and Nintendo’s shares went down 400 yen (almost 5%) the following morning to 12,200 yen as news of the incident spread. Nintendo produces the game upon which the Pokémon anime series is based. Then-president of Nintendo, Hiroshi Yamauchi, said at a press conference the day after the episode had aired that the video game company was not responsible since the original Pokémon game for its Game Boy product was presented in black and white. This episode kept the episodes “Rougela’s Christmas” (“Holiday Hi-Jynx”) and “Iwark as a Bivouac” (“Snow Way Out!”) off their original broadcast date in Japan following the incident. To prevent any similar incidents from reoccurring, the Japanese government made the decision to remove the episode permanently from future re-broadcasting and it has not aired since, not even outside of Japan. The episode was dubbed and altered in the United States by 4Kids Entertainment to slow down the flashing lights, but this was abandoned after the Japanese government banned it and was never broadcast. Coincidentally, the episode aired around the same time Pokémon was being adapted for American audiences. 4Kids Entertainment took extra precaution in bright and flashing lights in the show, and altered lighting, and speed of lights for earlier episodes of their American release. In an effort to put the event out of the public’s minds and prevent trauma, the anime has not featured Porygon in any subsequent episodes. As a consequence of this Porygon and its derivates suffered from major unpopularity among the fans of the series. Its second-generation evolution, Porygon2, is the only second-generation Pokémon to never make an appearance in the anime. Its fourth-generation evolution, Porygon-Z, has not appeared in the anime either. However, they appeared with Porygon in the beginning of the film Kyurem vs. the Sword of Justice, in which all Pokémon (apart from Genesect) were shown. Masaaki Iwane, an animation supervisor and key animator for episodes outsourced to Studio Cockpit, said recently on his blog that Porygon and its evolutions may mysteriously appear in a future episode. An episode of the American animated television series South Park that first aired in November 1999, called “Chinpokomon”, revolves around a Pokémon-like phenomenon, called Chinpokomon, which the children of South Park become obsessed with. Chinpokomon toys and video games are sold to American children in South Park by a Japanese company. The company’s president, Mr. Hirohito, uses the toys to brainwash the American children, making them into his own army to topple the American government. These toys included a video game in which the player attempts to bomb Pearl Harbor. While playing this game, Kenny has an epileptic seizure and later dies, in reference to the Pokémon seizure incident. In The Simpsons episode “Thirty Minutes over Tokyo”, the Simpson family takes a vacation in Japan. After arriving at their hotel in Tokyo, Bart is seen watching an anime entitled Battling Seizure Robots, in which he asks “Isn’t this that cartoon that causes seizures?” again referencing the Pokémon seizure incident. The show in question features robots with rapidly flashing eyes, causing Bart, and soon the whole family to have seizures. The same flashing footage is shown over the episode’s credits. In the pilot episode of Drawn Together, Ling-Ling, who is a parody of the Pokémon Pikachu, states that his goal in the Drawn Together house is to “destroy all, and give children seizures”. There follows a scene with flashing lights, a direct reference to this episode. In So Yesterday, a novel by Scott Westerfeld, this episode is mentioned and shown to three of the characters, one of which ends up having a seizure as a result. The flashing red light that caused the seizure is also used in the story telling elements. The best known of these tales include Le Petit Chaperon rouge (Little Red Riding Hood), La Belle au bois dormant (Sleeping Beauty), Le Maître chat ou le Chat botté (Puss in Boots), Cendrillon ou la petite pantoufle de verre (Cinderella), La Barbe bleue (Bluebeard), Le Petit Poucet (Hop o’ My Thumb), Les Fées (Diamonds and Toads), La Marquise de Salusses ou la Patience de Griselidis (Patient Griselda), Les Souhaits ridicules (The Ridiculous Wishes), Peau d’Âne (Donkeyskin), and Riquet à la houppe (Ricky of the Tuft). When the Academy of Inscriptions and Belles-Lettres was founded in 1663, Perrault was appointed its secretary. He gained the position after writing a poem on the sale of Dunkirk to France. His poem was seen as evidence of his ability to be a member of Jean-Baptiste Colbert’s select ‘petite committee’. He took part in the creation of the Academy of Sciences as well as the restoration of the Académie des Beaux-Arts. In 1671, shortly after writing the poem “Carrousel de 1662,” he was elected to the French Academy. By age 55 he was effectively in retirement from his public service and applied himself more to the affairs of the Academie and to writing. During this time he produced many large scale poems of Christian inspiration. His first literary attempts were a parody of the sixth book of Virgil’s Aenid, and a short poem, “Les Ruines de Troie ou l’Origine du Burlesque.” As a poet he attempted to revive the old epic, adapting it to a Christian subject, in “Saint-Paulin” (1686). His preface to “Le siècle de Louis le Grand,” soon followed by “Parallèle des Anciens et des Modernes,” started the famous literary quarrel of the Ancients versus Moderns. He asserted that under Louis XIV the arts had reached new heights never before achieved. His argument did not set well with those who revered the legacy of the Greeks and Romans. Jacques-Benigne Bossuet, François Fénelon, and Nicolas Boileau-Despréaux argued for the Ancients. He married in 1672 to Marie Guichon, 19, who died six years later in 1678, after giving birth to a daughter. In addition the couple had three sons. In 1695, when he was 62, he lost his post as secretary at the Academy of Inscriptions and Belles-Lettres. He decided to dedicate himself to his children and published Tales and Stories of the Past with Morals (Histoires ou Contes du Temps passé) (1697), with the subtitle: Tales of Mother Goose (Les Contes de ma Mère l’Oie). Its publication became an instant success and he became widely-known beyond his own circles. With its publication a new literary genre was born, the fairy tale. He published it under the name of his last son (born in 1678), Pierre (Perrault) Darmancourt, (Armancourt was the name of a property he bought for him), probably fearful of criticism from the “Ancients.” In the tales, he used images from around him, such as the Chateau Ussé for Sleeping Beauty and in Puss-in-Boots, the Marquis of the Chateau d’Oiron, and contrasted his folktale subject matter with details and asides and subtext drawn from the world of fashion. Perrault died in Paris in 1703 at age 75. At that time “Perrault’s Contes” were at the peak of their popularity. They were tales that people had known since their childhoods and publishers, aware of what popular readership could mean financially, released many editions of the “Contes,” in formats and prices accessible to the masses. Perrault acquired unprecedented popularity, and between 1842 and 1913, there were no less than 233 editions of his fairy tales, by more than 60 different publishers, which amounted to an average of three or four publications annually. Perrault’s most famous stories are still in print today and have been made into operas, ballets (e.g., Tchaikovsky’s Sleeping Beauty), plays, musicals, and films, both live-action and animation. In March 1993 the town of Eaubonne, France, created the Charles Perrault Literary Critics’ Award, a national prize for the best published or unpublished books and articles, in the French language, dealing with children’s literature. 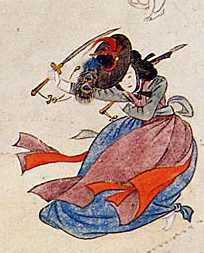 Geom-mu refers to a traditional sword dance practiced in Korea. Korean folk dancers perform Geom-mu with special costumes, dance motions, and music. The dance has earned a reputation of beauty and grace in performance. The dancers place special emphasis on the movement of the costumes, notably the sleeves, in harmony with the dance movements. The symbolic use of the Kal, a replica sword, keeps to the militaristic origins of the dance. Geom-mu has become a dance of great beauty, awarded the distinction as Intangible Cultural Treasure number 12 by the Republic of Korea. Geom-mu compounds two Chinese characters: “Geom,” meaning sword, and “Mu,” meaning dance. That name applies to the basic forms of the dance. “Hwangchang-mu” refers to the story of the origin of the sword dance. “Jinju-Geommu” refers to the royal court version of the dance. Surviving as a folk dance and cultural asset, Geom-mu changed considerably during the Joseon Dynasty period from 1392 through 1910. During the Joseon dynasty, the Royal Court rearranged Geom-mu, as Kisaeng recreated the dance. Kisaeng learned the formalized dance through the Gwonbeon, a pre-Korean War performance institution comparable to the Geisha tradition of Japan. In a major change, the Kisaeng performers discontinued wearing the traditional mask while dancing Geom-mu. Geom-mu remained a Court dance in the form of Jinju-Geomu but also remained a female dance. The Joseon court modified Geom-mu so that performers used replica swords to avoid accidental injuries to the performer and audience. Dancers of Geom-mu wear Hanbok, Kwaeja (overcoat), Jeon-Dae (belt), and Jeon-Rip (military style cap). Hanbok, the traditional Korean dress, consists of Chima (a skirt) and Jeogori (a jacket). Those elements combine to form a stylized version of the Joseon Dynasty military uniform. The costume traditionally has the colors of blue, red, yellow, green and black although many regional variations exist. The Jinju region has a blue Chima and a jade green Jeogori. Gwangju in the Jeolla province has a red Chima and a light green Jeogori. Dancers use a Kal, or replica sword, in Geom-mu. Three rings, called Kukhwa, position between the blade and the handle. Those three rings have varying sizes, making sounds when performers dance the Geom-mu. A group of six to eight dancers normally perform Geom-mu. “Chum-sawi,” a dance motion, and “Changdan,” rhythmic cycle or ‘long and short’ constitute two unique characteristics of Geom-mu. Three typical motions—Ipchum-sawi, Anjeon-sawi, and Yeonpungdae—combine to create the choreography. In Ipchum-sawi, the dancers form two rows, standing face to face. Dancers perform kneeling down in the Anjeon-sawi movement while maintaining the two rows of Ipchum-sawi. In the last motion, Yeonpungdae, the dancers form a circle and rotate in pattern. In Geom-mu, dancers perform special rhythmic cycles called Changdan, using Janggu, a double-headed hourglass drum and Buk, a barrel drum. In Korea, many variations of Changdan exist each with a name designating a certain type of meter, tempo, and beat. The basic nature of Korean rhythmic patterns have those four main characteristics. 1. A length of time, short enough to be held easily in memory and quickly recognized. “Samhyeon-Nyukgak” represents the Korean traditional music used in Geom-mu. Originally, Samhyeon designated three chordophones, Geomungo, Gayageum, and Hyangbipa and Nyukgak designated Buk, Janggu, Haegeum, and Piri in the Unified Silla period from 654 C.E. to 780 C.E.. The significance of Samhyeon disappeared, remaining through the transmission of Nyukgak. Contemporarily, Samhyeonnyukgak refers to the wind instrumental music used to accompany marching and dancing with six instruments: Haegeum, Janggu, Buk, Daegeum, and two Piri. Haegeum, a string instrument, resembles a violin. [Jangu] and [buk] are drums. Craftsmen make Changgu with a hollow wooden body and two leather skins. The two sides produce sounds of different pitch and tone. Puk, played with both an open hand and a wooden stick in the other hand, has a barrel-shape with a round wooden body covered on both ends with animal skin. Daegeum and Piri are aerophones; Daegeum, a large bamboo transverse flute, and Piri, a double reed instrument made of bamboo. Piri’s large reed and cylindrical bore produces a sound mellower than many other types of oboe. Many aspects of the Geom-mu have been forgotten. The Republic of Korea passed the Cultural Properties Protection Act in 1962 named to preserve intangible cultural properties. In 1967, the Republic of Korea named Geom-mu Intangible Cultural Property no. 12. The Jinju province of South Korea actively preserves and performs Geom-Mu. Margaret Hughes (c. 1645 – 1 October 1719), also Peg Hughes or Margaret Hewes, is often credited as the first professional actress on the English stage. Hughes was also famous as the mistress of the English Civil War general and later Restoration admiral, Prince Rupert of the Rhine. Hughes became an actress during a period of great change in English drama. English drama had suffered greatly during the English Civil War and the Interregnum, being banned by a Puritan Parliament in 1642. This ban was finally lifted upon the Restoration of King Charles. Charles was a keen theatre-goer, and promptly gave two royal patents to Sir Thomas Killigrew and Sir William Davenant. During the Renaissance women had been almost exclusively banned from appearing as actresses on the stage, and there was a history of embarrassing incidents occurring for male actors in female roles. One famous incident occurred when a play which King Charles II was watching suddenly stopped. When he sent servants to see what the problem was it was found that the male that was supposed to play one of the female parts was still shaving. There were also concerns over this practice encouraging ‘unnatural vice’, which added to Charles’ decision to issue a royal warrant in 1662 declaring that all female roles should be played only by female actresses. Killigrew and Davenant were casting women almost immediately following the Restoration, and once women began appearing professionally on the stage in the early 1660s, they won quick acceptance. Killigrew staged an all-female-cast production of his own play The Parson’s Wedding in 1664, and again in 1672. Hughes may have been the first professional actress in England. The occasion of her first performance was on 8 December 1660, in a production of Shakespeare’s play Othello, when she played the role of Desdemona in a production by Thomas Killigrew’s new King’s Company at their Vere Street theatre. There remains some uncertainty over this, however. Some other historians place Anne Marshall as the first such actress, and there has been much analysis of the early recollections of John Downes, whose memories of the 1660s form a key part of Hughes’ claim in this regard. Hughes was famous for her charms as an actress; diarist Samuel Pepys considered her ‘a mighty pretty woman’, and she was said to be a ‘a great beauty, with dark ringletted hair, a fine figure, and particularly good legs’. Pepys suggested that she was a lover of Sir Charles Sedley, a noted dramatist and “famous fop”, in the 1660s; she was reportedly also involved with Charles II himself, if only briefly. Hughes is also believed to have had an illegitimate son, Arthur, earlier in her career, who remained associated with drama in the capital. Most famously, however, Hughes became associated with Prince Rupert, Duke of Cumberland (sometimes known as “Rupert of the Rhine”) as his morganatic wife. 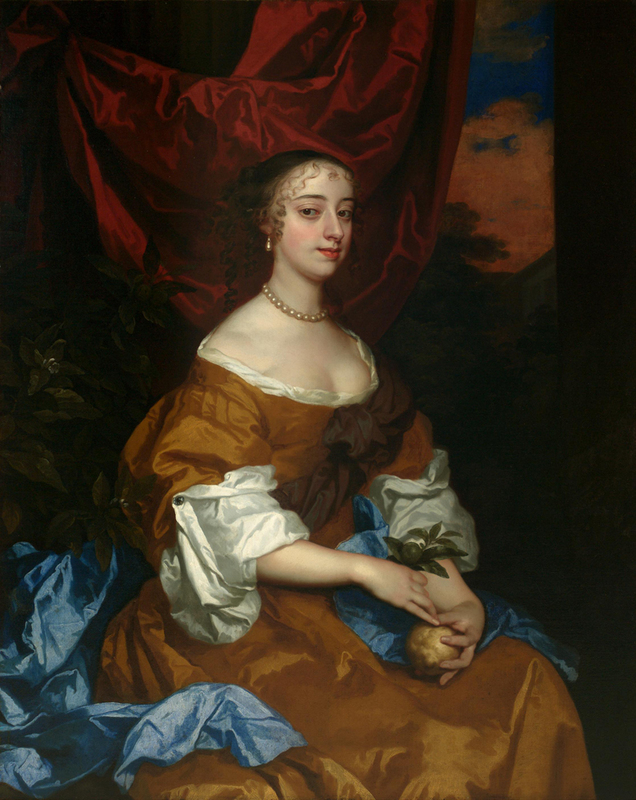 Rupert fell in love with her in the late 1660s, although Hughes appears to have held out reciprocating his attentions with the aim of negotiating a suitable settlement. Prince Rupert was one of the most senior members of the royal family at court, and Hughes rapidly received advancement through his patronage; she became a member of the King’s Company by 1669, giving her status and immunity from arrest for debt, and was painted four times by Sir Peter Lely, the foremost court artist of the day. Despite being encouraged to do so, Rupert did not formally marry Hughes, but acknowledged their daughter, Ruperta (later Howe), born in 1673. Hughes lived an expensive lifestyle during the 1670s, enjoying gambling and jewels; Rupert gave her at least £20,000 worth of jewellery during their relationship, including several items from the Palatinate royal collection. The two appear to have been close – Prince Rupert’s older brother, Charles Louis, Elector Palatine, once sounded out Rupert as to his willingness to return to the Rhineland and marry appropriately, but his suggestion was rejected. Margaret continued to act even after Ruperta’s birth, returning to the stage in 1676 with the prestigious Duke’s Company at the Dorset Garden Theatre, near the Strand in London. The next year Rupert established Hughes with a ‘grand building’ worth £25,000 that he bought in Hammersmith from Sir Nicholas Crispe. Prince Rupert died in 1682, leaving most of his estate, worth some £12,000, equally to Hughes and Ruperta. Hughes had an ‘uncomfortable widowhood’ without Rupert’s support, allegedly not helped by her continuing gambling. Presents from Rupert such as Elizabeth of Bohemia’s earrings were sold to the Duchess of Marlborough, whilst a pearl necklace given by Rupert’s father to Elizabeth was sold to fellow actress Nell Gwynn. Hughes sold the house in Hammersmith to two London merchants: Timothy Lannoy and George Treadwell — it ultimately was purchased by the Margrave of Brandenburg-Anspach and became known as Brandenburg (or Brandenburgh) House. Her daughter, Ruperta, ultimately married Emanuel Scrope Howe, future MP and English general. Hughes died in 1719. 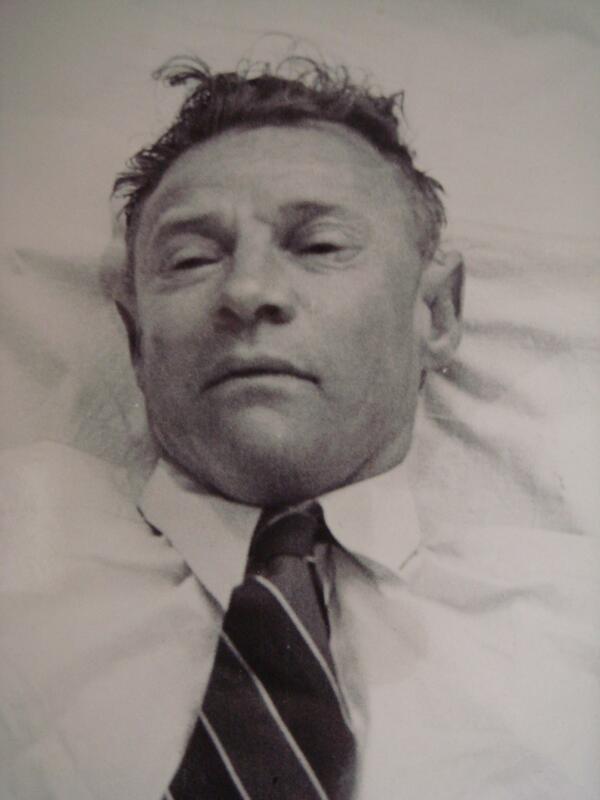 The Taman Shud Case, also known as the Mystery of the Somerton Man, is an unsolved case of an unidentified man found dead at 6:30 a.m., 1 December 1948, on Somerton beach in Adelaide, South Australia. It is named after a phrase, tamam shud, meaning “ended” or “finished” in Persian, on a scrap of the final page of The Rubaiyat, found in the hidden pocket of the man’s trousers. Considered “one of Australia’s most profound mysteries” at the time, the case has been the subject of intense speculation over the years regarding the identity of the victim, the events leading up to his death, and the cause of death. Public interest in the case remains significant because of a number of factors: the death occurring at a time of heightened tensions during the Cold War, what appeared to be a secret code on a scrap of paper found in his pocket, the use of an undetectable poison, his lack of identification, and the possibility of unrequited love. While the case has received the most scrutiny in Australia, it also gained international coverage, as the police widely distributed materials in an effort to identify the body, and consulted with other governments in tracking down leads. The body was discovered at 6:30 a.m. on 1 December 1948 on Somerton beach in Adelaide, South Australia and the police were called. When they arrived, the body was lying on the sand with its head resting on the seawall, and with its feet crossed and pointing directly to the sea. The police noted no disturbance to the body and observed that the man’s left arm was in a straight position and the right arm was bent double. An unlit cigarette was behind his ear and a half-smoked cigarette was on the right collar of his coat held in position by his cheek. A search of his pockets revealed a used bus ticket from the city to St. Leonards in Glenelg, an unused second-class rail ticket from the city to Henley Beach, a narrow aluminium American comb, a half-empty packet of Juicy Fruit chewing gum, an Army Club cigarette packet containing Kensitas cigarettes, and a quarter-full box of Bryant & May matches. The bus stop for which the ticket was used was around 1,100 metres (3,600 ft) north of the body’s location. Witnesses who came forward said that on the evening of 30 November, they had seen an individual resembling the dead man lying on his back in the same spot and position near the Crippled Children’s Home where the corpse was later found. A couple who saw him around 7 p.m. noted that they saw him extend his right arm to its fullest extent and then drop it limply. Another couple who saw him from 7:30 p.m. to 8 p.m., during which time the street lights had come on, recounted that they did not see him move during the half an hour in which he was in view, although they did have the impression that his position had changed. Although they commented between themselves that he must be dead because he was not reacting to the mosquitoes, they had thought it more likely that he was drunk or asleep, and thus did not investigate further. Witnesses said the body was in the same position when the police viewed it. According to the pathologist, Sir John Burton Cleland, emeritus professor at the University of Adelaide, the man was of “Britisher” appearance and thought to be aged about 40–45; he was in top physical condition. He was 180 centimetres (5 ft 11 in) tall, with hazel eyes, fair to ginger-coloured hair, slightly grey around the temples, with broad shoulders and a narrow waist, hands and nails that showed no signs of manual labour, big and little toes that met in a wedge shape, like those of a dancer or someone who wore boots with pointed toes; and pronounced high calf muscles like those of a ballet dancer. These can be dominant genetic traits, and they are also a characteristic of many middle and long-distance runners. He was dressed in “quality clothing:” consisting of a white shirt, red and blue tie, brown trousers, socks and shoes and, although it had been a hot day and very warm night, a brown knitted pullover and fashionable European grey and brown double-breasted coat. All labels on his clothes were missing, and he had no hat (unusual for 1948, and especially so for someone wearing a suit) or wallet. Clean-shaven and with no distinguishing marks, the man carried no identification, which led police to believe he had committed suicide. His teeth did not match the dental records of any known person in Australia. The autopsy showed that the man’s last meal was a pasty eaten three to four hours before death, but tests failed to reveal any foreign substance in the body. The pathologist Dr. Dwyer concluded: “I am quite convinced the death could not have been natural …the poison I suggested was a barbiturate or a soluble hypnotic”. Although poisoning remained a prime suspicion, the pasty was not believed to be the source of the poison. Other than that, the coroner was unable to reach a conclusion as to the man’s identity, cause of death, or whether the man seen alive at Somerton Beach on the evening of 30 November was the same man, as nobody had seen his face at that time. Scotland Yard was called in to assist with the case but with little result. Wide circulation in the world of a photograph of the man and details of his fingerprints yielded no positive identification. As the body was not identified, it was embalmed on 10 December 1948. The police said this was the first time they knew that such action was needed. On 3 December 1948, E.C. Johnson walked into a police station to identify himself as living and was dropped from potential as the dead man. That same day, The News published a photograph of the dead man on its front page, leading to additional calls from members of the public about the possible identity of the dead man. By the fourth of December, police had announced that the man’s fingerprints were not on South Australian police records, forcing them to look further afield. On 5 December, The Advertiser reported that police were searching through military records after a man claimed to have had a drink with a man resembling the dead man at a hotel in Glenelg on 13 November. During their drinking session, the mystery man supposedly produced a military pension card bearing the name “Solomonson”. A number of possible identifications of the body were made, including one in early January 1949 when two people identified the body as that of 63-year-old former wood cutter Robert Walsh. A third person, James Mack, also viewed the body, initially could not identify it, but an hour later he contacted police to claim it was Robert Walsh. Mack stated that the reason he did not confirm this at the viewing was a difference in the colour of the hair. Walsh had left Adelaide several months earlier to buy sheep in Queensland but had failed to return at Christmas as planned. Police were sceptical, believing Walsh to be too old to be the dead man. However, the police did state that the body was consistent with that of a man who had been a wood cutter, although the state of the man’s hands indicated he had not cut wood for at least 18 months. Any thoughts that a positive identification had been made were quashed, however, when Mrs Elizabeth Thompson, one of the people who had earlier positively identified the body as Mr Walsh, retracted her statement after a second viewing of the body, where the absence of a particular scar on the body, as well as the size of the dead man’s legs, led her to realise the body was not Mr Walsh. By early February 1949, there had been eight different “positive” identifications of the body, including two Darwin men who thought the body was of a friend of theirs, and others who thought it was a missing stablehand, a worker on a steamship or a Swedish man. Victorian detectives initially believed the man was from the state of Victoria because of the similarity of the laundry marks to those used by several dry-cleaning firms in Melbourne. Following publication of the man’s photograph in Victoria, 28 people claimed they knew his identity. Victorian detectives disproved all the claims and said that “other investigations” indicated it was unlikely that he was a Victorian. A new twist in the case occurred on 14 January 1949, when staff at Adelaide Railway Station discovered a brown suitcase with its label removed, which had been checked into the station cloakroom after 11:00 a.m. on 30 November 1948. In the case were a red checked dressing gown, a size seven, red felt pair of slippers; four pairs of underpants, pyjamas, shaving items, a light brown pair of trousers with sand in the cuffs, an electrician’s screwdriver, a table knife cut down into a short sharp instrument, a pair of scissors with sharpened points, and a stencilling brush, as used by third officers on merchant ships for stencilling cargo. Also in the suitcase was a thread card of Barbour brand orange waxed thread of “an unusual type” not available in Australia—it was the same as that used to repair the lining in a pocket of the trousers the dead man was wearing. All identification marks on the clothes had been removed but police found the name “T. Keane” on a tie, “Keane” on a laundry bag and “Kean” (without the last e) on a singlet, along with three dry-cleaning marks; 1171/7, 4393/7 and 3053/7. Police believed that whoever removed the clothing tags purposefully left the Keane tags on the clothes, knowing Keane was not the dead man’s name.It has since been noted that the “Kean” tags were the only ones that could not have been removed without damaging the clothing. Another seaman, Tommy Reade from the SS Cycle, in port at the time, was thought to be the dead man but after some of his shipmates viewed the body at the morgue, they stated categorically that the corpse was not that of Tommy Reade. A search concluded that there was no T. Keane missing in any English-speaking country and a nation-wide circulation of the dry-cleaning marks also proved fruitless. In fact, all that could be garnered from the suitcase was that since a coat in the suitcase had a front gusset and featherstitching, it could have been made only in the United States, as this was the only country that possessed the machinery for that stitch. Although mass-produced, the body work is done when the owner is fitted before it is completed. The coat had not been imported, indicating the man had been in the United States or bought the coat from someone of similar size who had been. Police checked incoming train records and believed the man had arrived by overnight train from either Melbourne, Sydney or Port Augusta. They believed he then showered and shaved at the adjacent City Baths before returning to the train station to purchase a ticket for the 10:50 a.m. train to Henley Beach, which, for whatever reason, he missed or did not catch. After returning from the city baths, he checked in his suitcase at the station cloak room before catching a bus to Glenelg. Derek Abbott, who studied the case, believes that the man may have purchased the train ticket before showering. The railway station’s own public facilities were closed that day and discovering this and then having to walk to the adjacent city baths to shower would have added up to 30 minutes to the time he would have expected to take, which could explain why he missed the Henley Beach train and took the next available bus. A coroner’s inquest into the death, conducted by coroner Thomas Erskine Cleland, commenced a few days after the body was found but was adjourned until 17 June 1949. The investigating pathologist Sir John Burton Cleland re-examined the body and made a number of discoveries. Cleland noted that the man’s shoes were remarkably clean and appeared to have been recently polished, rather than being in the state expected of the shoes of a man who had apparently been wandering around Glenelg all day. He added that this evidence fitted in with the theory that the body might have been brought to Somerton beach after the man’s death, accounting for the lack of evidence of vomiting and convulsions, the two main effects of poison. Cedric Stanton Hicks, Professor of Physiology and Pharmacology at the University of Adelaide, testified that of a group of drugs, variants of a drug in that group he called number 1 and in particular number 2 were extremely toxic in a relatively small oral dose that would be extremely difficult if not impossible to identify even if it had been suspected in the first instance. He gave the coroner a piece of paper with the names of the two drugs which was entered as Exhibit C.18. The names were not released to the public until the 1980s as at the time they were “quite easily procurable by the ordinary individual” from a chemist without the need to give a reason for the purchase. (The drugs were later publicly identified as digitalis and ouabain.) He noted the only “fact” not found in relation to the body was evidence of vomiting. He then stated its absence was not unknown but that he could not make a “frank conclusion” without it. Hicks stated that if death had occurred seven hours after the man was last seen to move, it would imply a massive dose that could still have been undetectable. It was noted that the movement seen by witnesses at 7 p.m. could have been the last convulsion preceding death. Early in the inquiry, Cleland stated “I would be prepared to find that he died from poison, that the poison was probably a glucoside and that it was not accidentally administered; but I cannot say whether it was administered by the deceased himself or by some other person.” Despite these findings, he could not determine the cause of death of the Somerton Man. The lack of success in determining the identity and cause of death of the Somerton Man had led authorities to call it an “unparalleled mystery” and believe that the cause of death might never be known. An editorial called the case “one of Australia’s most profound mysteries” and noted that if he died by poison so rare and obscure it could not be identified by toxicology experts, then surely the culprit’s advanced knowledge of toxic substances pointed to something more serious than a mere domestic poisoning. Around the same time as the inquest, a tiny piece of rolled-up paper with the words “Tamam Shud” printed on it was found deep in a fob pocket sewn within the dead man’s trouser pocket. Public library officials called in to translate the text identified it as a phrase meaning “ended” or “finished” found on the last page of the Rubaiyat of Omar Khayyam. The paper’s verso side was blank. Police conducted an Australia-wide search to find a copy of the book that had a similarly blank verso. A photograph of the scrap of paper was sent to interstate police and released to the public, leading a man to reveal he had found a very rare first edition copy of Edward FitzGerald’s translation of The Rubaiyat, published in 1859 by Whitcombe and Tombs in New Zealand, in the back seat of his unlocked car that had been parked in Jetty Road Glenelg about a week or two before the body was found. He had known nothing of the book’s connection to the case until he saw an article in the previous day’s newspaper. This man’s identity and profession were withheld by the police, as he wished to remain anonymous. The theme of the Rubaiyat of Omar Khayyam is that one should live life to the full and have no regrets when it ends. The poem’s subject led police to theorise that the man had committed suicide by poison, although there was no other evidence to back the theory. The book was missing the words “Tamam Shud” on the last page, which had a blank reverse, and microscopic tests indicated that the piece of paper was from the page torn from the book. There are insufficient symbols to provide a pattern. The symbols could be a complex substitute code or the meaningless response to a disturbed mind. It is not possible to provide a satisfactory answer. Also found in the back of the book was an unlisted telephone number belonging to a former nurse who lived in Moseley St, Glenelg, around 400 metres (1,300 ft) north of the location where the body was found. The woman said that while she was working at Royal North Shore Hospital in Sydney during World War II she owned a copy of The Rubaiyat but in 1945, at the Clifton Gardens Hotel in Sydney, had given it to an army lieutenant named Alfred Boxall who was serving in the Water Transport Section of the Australian Army. According to media reports the woman stated that after the war she had moved to Melbourne and married. Later she had received a letter from Boxall, but had told him she was now married. She added that in late 1948 a mystery man had asked her next door neighbour about her. There is no evidence that Boxall, who did not know the woman’s married name, had any contact with her after 1945. Shown the plaster cast bust of the dead man by Detective sergeant Leane, the woman could not identify it. According to Leane, he described her reaction upon seeing the cast as “completely taken aback, to the point of giving the appearance that she was about to faint.” In his 2002 video interview, Paul Lawson, the technician who made the body cast and was present when the woman viewed it, refers to her as ‘Mrs Thomson’ and noted that after looking at the bust she immediately looked away and would not look at it again. The woman now lived in Glenelg but denied all knowledge of the dead man or why he would choose to visit her suburb on the night of his death. She also asked that as she was now married she would prefer not to have her name recorded to save her from potential embarrassment of being linked to the dead man and Boxall. The police agreed, leaving subsequent investigations without the benefit of the case’s best lead. In a TV programme on the case, in the section where Boxall was interviewed, her name was given in a voice-over as Jestyn, apparently obtained from the signature Jestyn that followed the verse written in the front of the book, but this was covered over when the book was displayed in the programme. This was possibly a “pet” nickname and was the name she used when introduced to Boxall. Retired detective Gerald Feltus, who had handled the cold case, interviewed Jestyn in 2002 and found her to be either “evasive” or “just did not wish to talk about it,” she also stated that her family did not know of her connection with the case and he agreed not to disclose her identity or anything that might reveal it. Feltus believes that Jestyn knew the Somerton man’s identity. Jestyn had told police that she was married, but they did not record Jestyn’s name on the police file, and there is no evidence that police at the time knew that she was in fact not married. Researchers re-investigating the case attempted to track down Jestyn and found she had died in 2007. Her real name was considered important as the possibility exists that it may be the decryption key for the code. In his 2010 book, Feltus claims he was given permission by Jestyn’s husband’s family to disclose the names, however, the names he revealed in his book are believed to be pseudonyms. Rumours began circulating that Boxall was involved in military intelligence during the War, adding to the speculation that the dead man was a Soviet spy poisoned by unknown enemies. In a 1978 television interview with Boxall, the interviewer states, “Mr Boxall, you had been working, hadn’t you, in an intelligence unit, before you met this young woman [Jestyn]. Did you talk to her about that at all?” In reply he stated “No,” and when asked if she could have known, Boxall replied “not unless somebody else told her.” When the interviewer went on to suggest that there was a spy connection, Boxall replied after a pause, “It’s quite a melodramatic thesis, isn’t it?” In fact Alfred Boxall served in the 2/1 NAOU, the North Australian Observer Unit, and the intelligence he was gathering was any sign of Japanese infiltration from Timor. The fact that the man died in Adelaide, the nearest capital city to Woomera, a top-secret missile launching and intelligence gathering site, heightened this speculation. It was also recalled that one possible location from which the man might have travelled to Adelaide was Port Augusta, a town relatively close to Woomera. Additionally, in April 1947 the United States Army’s Signal Intelligence Service, as part of Operation Venona, discovered that there had been top secret material leaked from Australia’s Department of External Affairs to the Soviet embassy in Canberra. This led to a 1948 U.S. ban on the transfer of all classified information to Australia. As a response, the Australian government announced that it would establish a national secret security service (which became the Australian Security Intelligence Organisation (ASIO)). Following the inquest, a plaster cast was made of the man’s head and shoulders, and he was then buried at Adelaide’s West Terrace Cemetery. The Salvation Army conducted the service and The South Australian Grandstand Bookmakers Association paid for the service to save the man from a pauper’s burial. Years after the burial, flowers began appearing on the grave. Police questioned a woman seen leaving the cemetery but she claimed she knew nothing of the man. About the same time, the receptionist from the Strathmore Hotel, opposite Adelaide Railway Station, revealed that a strange man had stayed in Room 21 around the time of the death, checking out on 30 November 1948. She recalled that cleaners found a black medical case and a hypodermic syringe in the room. There have been numerous unsuccessful attempts in the 60 years since its discovery to crack the code found at the rear of the book, including efforts by military and naval intelligence, mathematicians, astrologers and amateur code crackers. While no answer has been accepted as correct, a leading theory is that the code indicates the initial letters of words. In 2004, retired detective Gerry Feltus suggested in a Sunday Mail article that the final line “ITTMTSAMSTGAB” could start “It’s Time To Move To South Australia Moseley Street…” (the former nurse lived in Moseley Street which is the main road through Glenelg). The Australian Broadcasting Corporation, in its documentary series Inside Story, in 1978 produced a programme on the Taman Shud case, entitled The Somerton Beach Mystery, where reporter Stuart Littlemore investigated the case, including interviewing Boxall, who could add no new information on the case, and Paul Lawson, who made the plaster cast of the body, and who refused to answer a question about whether anyone had positively identified the body. In 1994 John Harber Phillips, Chief Justice of Victoria and Chairman of the Victorian Institute of Forensic Medicine, reviewed the case to determine the cause of death and concluded that “There seems little doubt it was digitalis.” Phillips supported his conclusion by pointing out that the organs were engorged, consistent with digitalis, the lack of evidence of natural disease and “the absence of anything seen macroscopically which could account for the death”. Three months prior to the death of the man, on 16 August 1948, an overdose of digitalis was reported as the cause of death for United States Assistant Treasury Secretary Harry Dexter White. He had been accused of Soviet espionage under Operation Venona. The case is still considered “open” at the South Australian Major Crime Task Force. The South Australian Police Historical Society holds the bust, which contains strands of the man’s hair. Any further attempts to identify the body have been hampered by the embalming formaldehyde having destroyed much of the man’s DNA. Other key evidence no longer exists, such as the brown suitcase, which was destroyed in 1986. In addition, witness statements have disappeared from the police file over the years. On 6 June 1949, the body of two-year-old Clive Mangnoson was found in a sack in the Largs Bay sand hills, about 20 kilometres (12 mi) down the coast from Somerton. Lying next to him was his unconscious father, Keith Waldemar Mangnoson. The father was taken to a hospital in a very weak condition, suffering from exposure; following a medical examination, he was transferred to a mental hospital. The Mangnosons had been missing for four days. The police believed that Clive had been dead for twenty-four hours when his body was found. The two were found by Neil McRae of Largs Bay, who claimed he had seen the location of the two in a dream the night before. The coroner could not determine the young Mangnoson’s cause of death, although it was not believed to be natural causes. The contents of the boy’s stomach were sent to a government analyst for further examination. Following the death, the boy’s mother, Roma Mangnoson, reported having been threatened by a masked man, who, while driving a battered cream car, almost ran her down outside her home in Cheapside Street, Largs North. Mrs Mangnoson stated that “the car stopped and a man with a khaki handkerchief over his face told her to ‘keep away from the police or else. '” Additionally a similar looking man had been recently seen lurking around the house. Mrs. Mangnoson believed that this situation was related to her husband’s attempt to identify the Somerton Man, believing him to be Carl Thompsen, who had worked with him in Renmark in 1939. J. M. Gower, secretary of the Largs North Progress Association received anonymous phone calls threatening that Mrs. Mangnoson would meet with an accident if he interfered while A. H. Curtis, the acting mayor of Port Adelaide received three anonymous phone calls threatening “an accident” if he “stuck his nose into the Mangnoson affair.” Police suspect the calls may be a hoax and the caller may be the same person who also terrorised a woman in a nearby suburb who had recently lost her husband in tragic circumstances. Soon after being interviewed by police over her harassment, Mrs. Mangnoson collapsed and required medical treatment. In June 1945, three years before the death of the Somerton Man, a 34-year-old Singaporean man named Joseph (George) Saul Haim Marshall was found dead in Ashton Park, Mosman, Sydney, with an open copy of the Rubaiyat of Omar Khayyam on his chest. His death is believed to be a suicide by poisoning. Marshall’s copy of the Rubaiyat was recorded as a seventh edition published in London by Methuen. In 2010 an investigation found that Methuen had published only five editions; the discrepancy has never been explained and has been linked to the inability to locate a copy of the Whitcombe and Tombs edition. Jestyn gave Alfred Boxall a copy of the Rubaiyat in Clifton Gardens two months after Marshall’s death. Clifton Gardens is adjacent to Ashton Park. Joseph Marshall was the brother of the famous barrister and Chief Minister of Singapore David Saul Marshall. An inquest was held for Joseph Marshall on 15 August 1945; Gwenneth Dorothy Graham testified at the inquest and was found dead 13 days later face down, naked, in a bath with her wrists slit. 1906 April: Alfred Boxall born in London, England. 1912 October: “Prosper Thomson”, Jestyn’s future husband, is born in central Queensland. 1921 “Jessica Powell” (Jestyn) is born in Marrickville, New South Wales. 1944 June: Alf Boxall’s daughter ‘Lesley’ is born. 3 June 1945: “George” Joseph Saul Haim Marshall is found dead from poisoning in Ashton Park, Mosman, Sydney. A copy of the Rubaiyat was found open next to his body. Ashton Park is directly adjacent to Clifton Gardens where Jestyn met Boxall two months later. 1945 August: Jestyn gives Alf Boxall an inscribed copy of the Rubaiyat over drinks at the Clifton Gardens Hotel, Sydney prior to his being posted overseas on active service. 1946: Jestyn is pregnant and moves to Mentone, Victoria to temporarily live with her parents. Early 1947: Jestyn moves to a suburb of Adelaide and changes her surname to that of her future husband. 1947 July: Jestyn’s son ‘Robin’ is born. 30 November 1948. 8:30 a.m. to 10:50 a.m.: The Somerton Man is presumed to have arrived in Adelaide by train. He buys a ticket for the 10:50 a.m. train to Henley Beach but did not use it. This ticket was the first sold of only three issued between 6:15 a.m. and 2 p.m. by this particular ticket clerk for the Henley Beach train. Between 11:00 a.m. and 12 noon: Checks a brown suitcase into the train station cloak room. after 11:15 a.m.: Buys a 7d bus ticket on a bus that departed at 11:15 a.m. from the south side of North Tce (in front of the Strathmore Hotel) opposite the railway station. He may have boarded at a later time elsewhere in the city as his ticket was the sixth of nine sold between the railway station and South Tce however, he only had a 15-minute window from the earliest time he could have checked his suitcase (the luggage room was around 60 metres from the bus stop). It is not known which stop he alighted at. The bus terminated at Somerton at 11:44am however, enquiries indicated that he “must have” alighted at Glenelg, a short distance from the St. Leonard’s hotel. This stop is less than 1 kilometre (3,300 ft) north of the Moseley St address of Jestyn, which was itself 400 m from where the body was found. 1 December, 2 a.m.: Estimated time of death. The time was estimated by a “quick opinion” on the state of rigor mortis while the ambulance was in transit. As a suspected suicide no attempt to determine the correct time was made. As poisons affect the progression of rigor, 2 a.m. is probably inaccurate. 6:30 a.m.: Found dead by John Lyons and two men with a horse. 6 June: The dead body of Clive Mangnoson is found 20 km away from Somerton by Neil McRae. 22 July: A man hands in the copy of the Rubaiyat he had found on 30 November containing the secret code. Police later match the “Tamám Shud” paper to the book. 26 July: The unlisted phone number is traced to “Jestyn” in Glenelg. Shown the plaster cast by Paul Lawson, “Jestyn” could not confirm or exclude that the man was Alf Boxall. Lawson’s diary entry for that day uses the name “Mrs Thompson” and stated that she had a “nice figure” and is “very acceptable” (referring to the level of beauty) which allows the possibility of an affair with the Somerton man. She was 27 years old in 1948. In a later interview Lawson described her behaviour as being very odd that day. Also she appeared as if she was about to faint. The following day Sydney detectives interview Alf Boxall. “Jestyn” requests that her real name be withheld because she didn’t want her husband to know she knew Alf Boxall. Although she was in fact not married at this time and her name was Jessica Powell, the name she gave police was Jessica Thomson with her real name not being discovered until 2002. Early 1950: “Prosper Thomson’s” divorce is finalised. 1950 May: Jestyn marries “Prosper Thomson”. 14 March 1958: The coroner’s inquest is continued. Jestyn and Alf Boxall are not mentioned. No new findings are recorded and the inquest is ended with an adjournment sine die. 1995: Jestyn’s husband Prosper dies. 2009 March: Jestyn’s son Robin dies. In March 2009 a University of Adelaide team led by Professor Derek Abbott began an attempt to solve the case through cracking the code and proposing to exhume the body to test for DNA. Abbott’s investigations have led to questions concerning the assumptions police had made on the case. Police had believed that the Kensitas brand cigarettes in the Army Club packet were due to the common practice at the time of buying cheap cigarettes and putting them in a packet belonging to a more expensive brand (Australia was still under wartime rationing). However, a check of government gazettes of the day indicated that Kensitas were actually the expensive brand, which opens the possibility (never investigated) that the source of the poison may have been in the cigarettes that were possibly substituted for the victim’s own without his knowledge. Abbott also tracked down the Barbour waxed cotton of the period and found packaging variations. This may provide clues to the country where it was purchased. Decryption of the “code” has been started from scratch. It has been determined that the letter frequency is considerably different from letters written down randomly; the frequency is to be further tested to determine if the alcohol level of the writer could alter random distribution. The format of the code also appears to follow the quatrain format of the Rubaiyat, supporting the theory that the code is a one-time pad encryption algorithm. To this end, copies of the Rubaiyat, as well as the Talmud and Bible, are being compared to the code using computers in order to get a statistical base for letter frequencies. However, the code’s short length may require the exact edition of the book used. With the original copy lost in the 1960s, researchers have been looking for a FitzGerald edition without success. Investigation had shown that the Somerton Man’s autopsy reports of 1948 and 1949 are now missing and the Barr Smith Library’s collection of Cleland’s notes do not contain anything on the case. Maciej Henneberg, Professor of Anatomy at the University of Adelaide, examined images of the Somerton man’s ears and found that the cymba (upper ear hollow) is larger than his cavum (lower ear hollow), a feature possessed by only 1–2% of the Caucasian population. In May 2009, Derek Abbott consulted with dental experts who concluded that the Somerton Man had hypodontia (a rare genetic disorder) of both lateral incisors, a feature present in only 2% of the general population. In June 2010, Abbott obtained a photograph of Jestyn’s son that clearly showed his ears and teeth. The photograph shows that the son not only had a larger cymba than his cavum, but also hypodontia. The chance that this is a coincidence has been estimated as between 1 in 10,000,000 and 1 in 20,000,000. The media has suggested that Jestyn’s son, who was 16-months old in 1948 and died in 2009, may have been a love child of either Alf Boxall or the Somerton Man and passed off as her husband’s. DNA testing would confirm or eliminate this speculation. In a current affairs programme on the efforts of the team, retired detective Gerry Feltus, who worked on the case for many years, admitted that he knew the identity of the mystery woman but, wanting to protect the woman’s privacy, refused to disclose it. However, Feltus does concede there are trails of information, publicly available, which lead to her identity. Feltus said he was still contacted by people in Europe who believed the man was a missing relative but did not believe an exhumation and finding the man’s family grouping would provide answers to relatives, as “during that period so many war criminals changed their names and came to different countries. In July 2013 Abbott released an artistic impression he commissioned of the Somerton man, believing this might finally lead to an identification. “All this time we’ve been publishing the autopsy photo, and it’s actually hard to tell what something looks like from that,” Prof Abbott said. In 2011, an Adelaide woman contacted Maciej Henneberg about an identification card of a H. C. Reynolds that she had found in her father’s possessions. The card, a document issued in the United States to foreign seamen during WWI, was given to biological anthropologist Maciej Henneberg in October 2011 for comparison of the ID photograph to that of the Somerton man. While Henneberg found anatomical similarities in features such as the nose, lips and eyes, he believed they were not as reliable as the close similarity of the ear. The ear shapes shared by both men were a “very good” match, although Henneberg also found what he called a “unique identifier;” a mole on the cheek that was the same shape and in the same position in both photographs. The ID card, numbered 58757, was issued in the United States on 28 February 1918 to H.C. Reynolds, giving his nationality as “British” and age as 18. Searches conducted by the US National Archives, the UK National Archives and the Australian War Memorial Research Centre have failed to find any records relating to H.C. Reynolds. The South Australia Police Major Crime Branch, who still have the case listed as open, will investigate the new information. In November 2013, the family of “Jestyn” gave an interview to 60 Minutes which was aired on 24 November. On the program, Kate Thomson, daughter of Jessica and Prosper Thomson, claims that her mother had told her that she had lied to police and that she did know the identity of the “Somerton Man” and that his identity was also “known to a level higher than the police force.” She also stated that she believed her mother and the “Somerton Man” may have both been Russian spies, noting that her mother was a communist sympathizer and could speak Russian although she would not disclose where she had learned it or why. Jessica Thomson’s daughter-in-law believes that the “Somerton Man” was her late husband’s father and with their daughter has lodged a new application with the Attorney-General to have the body exhumed and DNA tested. Professor Abbot has written to Attorney-General John Rau in support, saying that the new exhumation request would be consistent with the current government policy of identifying unidentified graves to bring closure to their families. Jestyn’s daughter Kate opposes the exhumation as being disrespectful to her brother. The Welland Canal has gone through many incarnations in its history. Today, five distinct canal-construction efforts are recognized. The retronym First Welland Canal is applied to the original canal, constructed from 1824 to 1829 and 1831 to 1833. The Great Lakes form an excellent navigation route into the interior of North America. Downstream from Niagara Falls, ships can reach the port city of Montreal without encountering major difficulties. Upstream, the lakes are navigable all the way to the western end of Lake Superior. Early on during the European settlement of North America, lack of other infrastructure made the Great Lakes the premier route to reach the interior of the continent, and later to ship materials and goods from the new frontiers. The Niagara Falls stood as a mighty barrier. To bypass it, a portage road between Queenston, Ontario and Chippawa was used, but the solution was far from optimal. The cargo had to be unloaded, carried 18 km up the Niagara Escarpment, then loaded onto different ships to continue on its way. The relatively narrow Niagara Peninsula, situated between Lake Ontario and Lake Erie, was a natural match to the idea of bypassing the Falls. Indeed, the idea of a canal across the Peninsula was examined as early as 1799, when a group headed by Robert Hamilton, a Queenston merchant, unsuccessfully petitioned the Legislative Assembly of Upper Canada. Hamilton’s plan called for a canal to be constructed between Fort Erie and, perhaps unsurprisingly, Queenston. In 1816, a young man called William Hamilton Merritt bought a rundown sawmill on the Twelve Mile Creek, and added a grist mill and a store. The Twelve flowed from its source south of the Escarpment to Lake Ontario, but its water levels varied considerably, creating difficulties for Merritt and his mills. In 1818, when the flow was especially low, Merritt pursued the idea of bringing water to his mills from the Welland River. On a bigger scale, the Erie Canal, dug from the Hudson River through northern New York, was about to reach Lake Erie. The impending completion meant the cargo from upper Great Lakes was about to head down the canal and Hudson River to New York City, bypassing its previous destination, Montreal. At the time, a considerable rivalry existed between Montreal and New York for cargo headed to Europe via ocean-going vessels. All of these factors contributed to the construction of the Welland Canal. In 1818, William Hamilton Merritt borrowed an instrument called a water level from Samuel Beckett, a mill owner in St. Johns. Along with George Keefer, John DeCew, and a couple of other neighbours he set out to survey a potential route for a water canal. From the headwaters of the Twelve Mile Creek near present-day Allanburg, they planned a line three kilometers south to meet with the Welland River. A ridge was encountered along the way, and using the instrument, the surveyors calculated it to be 10 meters high. It was actually double that height; the reason for the error is not known. On July 4, 1818, Merritt organized a meeting in St. Catharines. The outcome was a petition sent to Upper Canada Legislature to provide for construction of a canal between the Twelve Mile Creek and Welland River. Unlike Merritt’s original water-canal plan, the petition included plans for allowing boats to cross the Niagara Escarpment. In 1823, Hiram Tibbetts, an engineer, was employed to make a formal survey for the route. He suggested to dig a channel four feet below the surface level of Welland River between present-day Port Robinson and Allanburg, and then follow the Twelve Mile Creek northwest to DeCew’s Falls (where George DeCew owned a mill). There, it was suggested to descend the escarpment by an incline railway and continue along the creek to Port Dalhousie to reach Lake Ontario. On January 19, 1824, an act of the Legislature formed the Welland Canal Company, with a capitalization of $150,000 and Merritt as the financial agent. As part of his fundraising duties, he travelled extensively, including the United States and Great Britain. On November 30, 1824, approximately 200 people gathered near Allanburg to witness the sod-turning for the construction. Soon, contracts for the work were let out, but the actual construction didn’t start until July 1825. Wherever possible, natural waterways were used, but this was not possible for the construction of the canal between Port Robinson and Allanburg. In what was called the Deep Cut, a channel over three kilometers long was cut, sometimes as deep as 20 meters. No less than 750,000 cubic meters of earth was removed. Prior to the construction of the Welland Canal, the main settlements in the area were located along Lake Ontario and Niagara River, as the interior of the Niagara Peninsula remained hard to reach and rural areas, if that. As the construction progressed, however, shantytowns to house the labourers and their families were established along the way, giving birth to communities that later became Port Dalhousie, Merritton, Thorold, Allanburg and Port Robinson. As the Deep Cut progressed, plans were being made for an alternate route to Lake Erie. The original motivation behind the canal was to bring water to mills, and this was met by constructing a canal to the Welland River. However, as the plans evolved to include a ship route, they were accommodated by simply following the Welland River until it emptied into the Niagara River. This was suboptimal for a number of reasons, the main one being the strong current of Niagara and the proximity of the towering Niagara Falls that made the journey hard and uncomfortable. Due to this, a second route was planned to diverge from the canal at Port Robinson. It would follow the Welland River southwest, then branch off, following Forks Creek and a 20 kilometre channel cut through present-day Wainfleet and the Wainfleet Marsh to reach Grand River and Lake Erie. In September 1827, work on the Deep Cut was paused due to heavy rains. Many workers were transferred to construction of the canal in Wainfleet, and have made significant progress before Deep Cut work was resumed the following April. However, the rains continued. On November 9, 1828, just two weeks’ worth of work before completion of the Deep Cut, the banks of the cut near Port Robinson collapsed into the excavated channel, killing an unknown number of workers below. More landslides followed, and it soon became evident that making a cut deep enough as to use the Welland River as the source of canal water would not be possible. An alternate, sufficiently high source of water was necessary. Since the construction of a channel towards Grand River was already underway at the time of the Deep Cut failure, a dam across the mouth of the Grand was proposed soon after, in December 1828. From there, a channel could be dug to feed this level to the Welland Canal proper. An aqueduct would be used to cross the Welland River. The dam was relocated eight kilometers inland by naval authorities, mindful of its safety in times not long after the War of 1812. The settlement by the dam later evolved into present-day Dunnville. From there, the Feeder went southeast to Stromness, before turning northeast in a straight cut across the Wainfleet Marsh. Interestingly, the location chosen for the aqueduct across Welland River was not Port Robinson. Although the Welland Canal and River first met in Port Robinson, it was decided to dig the canal essentially parallel to the river for a couple of kilometers upstream before crossing it. The aqueducts of three subsequent canals were later built in the same spot. Once again, many of the Deep Cut labourers were transferred to the Feeder cut. The digging was finished in the span of 177 days, which was a large achievement at the time. 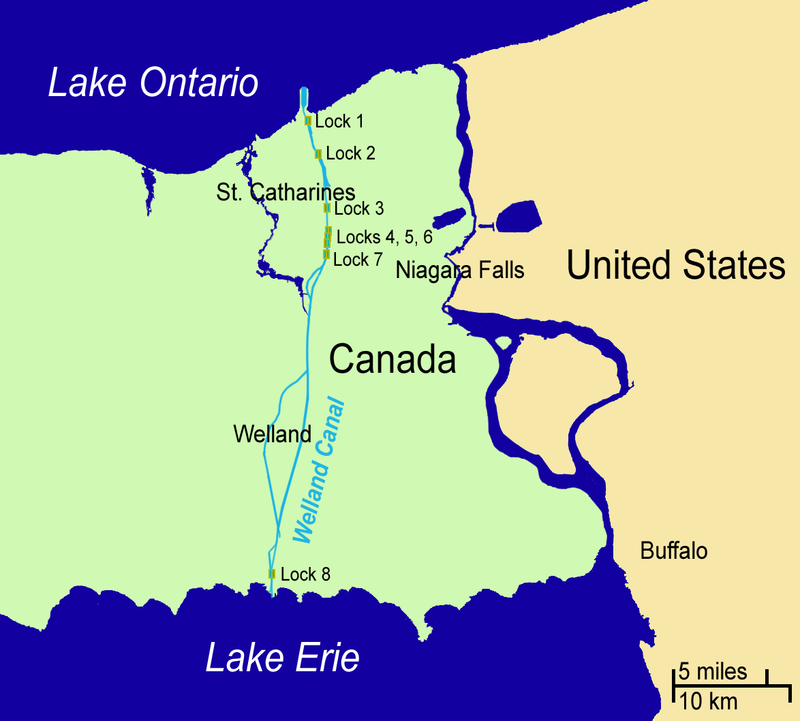 Lake Erie water was let into the Feeder and Welland Canals in November 1829. As with other locations in the peninsula, shantytowns sprung up along the Feeder Canal. These later developed into places like Dunnville, Wainfleet and Welland, among others. The Welland Canal was officially opened on November 30, 1829, exactly five years after the first turning of the sod. Two schooners, Annie and Jane from York, Upper Canada and R.H. Broughton from Youngstown, New York, left Port Dalhousie on Lake Ontario and arrived in Buffalo on the eastern end of Lake Erie two days later. Annie and Jane returned to Lake Ontario along the same route four days later. As mentioned before, the route to Lake Erie afforded by the canal, following the Welland and Niagara Rivers, was difficult and slow. The Feeder connected directly to Lake Erie, but it was long, and, not intended as a ship canal, of insufficient capacity. Over the course of the canal’s first full navigation season in 1830, it became evident that a more direct route was necessary. In March 1831, a location called Gravelly Bay (now Port Colborne) was chosen as the new Lake Erie terminus for the canal. It was one of the closest points on the Lake Erie shore, and also offered a natural harbour for the ships waiting to enter the canal. The new part of the canal was to run in a fairly straight line, except for a stretch where it followed a local ravine and a creek to minimise required excavation of hard rock in the area. The Welland Canal Company obtained a loan of 50,000 pounds from the Province of Upper Canada. Construction started soon after, but it was delayed by rain, difficulty in clearing land, and a cholera outbreak in 1832. Neither the Wainfleet Marsh nor the rock south of it were easy to dig in, but work was accelerated during mild weather of late 1832 and early 1833. On June 1, 1833, the schooner Matilda, headed for Cleveland from Oakville, became the first ship to travel through the new channel. Overall, the combined Welland and Feeder Canals stretched 44 kilometres (27 mi) between the two lakes, with 40 wooden locks. The minimum lock size was 33.5 m by 6.7 m (110 ft by 22 ft), with a minimum canal depth of 2.4 m (8 ft). Today, very little of the First Canal is evident. Much of the Feeder Canal, however is still present today in Wainfleet township. Perkin Warbeck (circa 1474 – 23 November 1499) was a pretender to the English throne during the reign of King Henry VII of England. By claiming to be Richard of Shrewsbury, 1st Duke of York, the younger son of King Edward IV, one of the “Princes in the Tower”, Warbeck was a significant threat to the newly established Tudor dynasty, and gained support outside England. Henry VII declared Warbeck an impostor and after his capture that he was a Fleming born in Tournai around 1474. Due to uncertainty as to whether Richard of Shrewsbury had died in the Tower of London or had survived, Warbeck’s claim gathered some followers, whether due to real belief in his identity or because of desire to overthrow Henry and reclaim the throne. Most historical accounts mention that Warbeck cost Henry VII over £13,000, putting a strain on Henry’s weak financial state. Perkin Warbeck’s personal history has been fraught with many unreliable and varying statements. He himself gave out that he was Richard of Shrewsbury, Duke of York, the younger son of King Edward IV. After he was captured and interrogated in 1497 under the eye of King Henry VII, another version of his life was published, based on his confession. This confession is considered by many historians to be possibly only partially true as it was procured under duress. According to the confession, Warbeck was born to a man called John Osbeck (also known as Jehan de Werbecque). Osbeck, who was married to Warbeck’s mother Katherine de Faro, was Flemish and held the occupation of comptroller to the city of Tournai. These family ties are backed up by several municipal archives of Tournai which mention most of the people whom Warbeck declared he was related to. He was taken to Antwerp by his mother at around age ten to learn Dutch. From here, he was undertaken by several masters around Antwerp and Middelburg before being employed by a local English merchant named John Strewe for a few months. After his time in the Netherlands, Warbeck yearned to visit other countries and was hired by a Breton merchant. This merchant eventually brought Warbeck to Cork, Ireland in 1491 when he was about seventeen, and it was here that he learnt to speak English. Warbeck then claims that upon seeing him dressed in silk clothes, some of the citizens of Cork who were Yorkists demanded to “[do] him the honour as a member of the Royal House of York.” He said they did this because they were resolved in gaining revenge on the King of England and decided that he would claim to be the younger son of King Edward IV. However, many historians believe that Warbeck lied about the story of how he came to be a pretender in order to cover his tracks and hopefully allow himself to escape the death penalty. Warbeck first claimed the English throne at the court of Burgundy in 1490. In 1491, Warbeck landed in Ireland in the hope of gaining support for his claim as Lambert Simnel had four years previously. However, little support was found and he was forced to return to the European mainland. There his fortunes improved. He was first received by Charles VIII of France, but in 1492 was expelled under the terms of the Treaty of Etaples, by which Charles had agreed not to shelter rebels against Henry VII. He was publicly recognized as Richard of Shrewsbury by Margaret of York, the widow of Charles the Bold, the sister of Edward IV and thus the aunt of the Princes in the Tower. Whether Margaret truly believed that the pretender was her nephew Richard, or whether she considered him a fraud but supported him anyway, is unknown, but she tutored him in the ways of the Yorkist court. Henry complained to Philip of Habsburg, Duke of Burgundy, about the harbouring of the pretender, and, since he was ignored, imposed a trade embargo on Burgundy, cutting off important Burgundian trade-links with England. The pretender was also welcomed by various other monarchs and was known in international diplomacy as the Duke of York. At the invitation of Duke Philip’s father, King Maximilian I, in 1493 he attended the funeral of the Emperor Frederick III and was recognised as King Richard IV of England. The pretender also promised that if he died before becoming king, his claim would fall to Maximilian. On 3 July 1495, funded by Margaret of Burgundy, Warbeck landed at Deal in Kent, hoping for a show of popular support. Warbeck’s small army was routed and 150 of the pretender’s troops were killed without Warbeck even disembarking. He was forced to retreat almost immediately, this time to Ireland. There he found support from Maurice FitzGerald, 9th Earl of Desmond, and laid siege to Waterford, but, meeting resistance, he fled to Scotland. Henry pardoned his Irish supporters, remarking drily “I suppose they will crown an ape next”. Warbeck was well received by James IV of Scotland who realised that his presence gave him international leverage. As Ferdinand and Isabella of Spain were negotiating an alliance with Henry VII, James IV knew that Spain would help him in his struggles with England, in order to prevent the situation escalating into war with France. Spanish ambassadors arrived in Edinburgh, and later Pedro de Ayala was established as a resident ambassador during the crisis. Warbeck was permitted to marry James’s distant cousin, Lady Catherine Gordon, a daughter of George Gordon, 2nd Earl of Huntly. The marriage was celebrated in Edinburgh with a tournament. James gave Warbeck clothes for the wedding and armour covered with purple silk. The historian Katie Stevenson suggests the clothing bought for the tournament shows Warbeck fought in a team with the king and four knights. A copy of a love letter in Latin obtained by Pedro de Ayala, is thought to be Warbeck’s proposal to Lady Catherine. In September 1496, James IV prepared to invade England with Warbeck. A red, gold and silver banner was made for Warbeck as the Duke of York; James’s armour was gilded and painted; and the royal artillery was prepared. John Ramsay of Balmain (who called himself Lord Bothwell) described the events for Henry VII. He saw Roderic de Lalanne, a Flemish knight arrive with two little ships and 60 German soldiers and meet James IV and talk to Warbeck. In Edinburgh Castle Ramsay saw two great French guns called ‘curtalds,’ 10 falconets or little serpentines, and 30 iron breech loading ‘cart guns’ with 16 close-carts or wagons for the munitions. He estimated the invasion force would last only 4 to 5 days in England before it ran out of provisions. He suggested, from the safety of Berwick upon Tweed, that the Scots could be vanquished by a modest English force attacking from north and south in a pincer movement. Later, wishing to be rid of Warbeck, James IV provided a ship called the Cuckoo and a hired crew under a Breton captain which returned Perkin to Waterford in shame in July 1497. James IV made peace with England by signing the Treaty of Ayton at St Dionysius’s Church in Ayton in Berwickshire. Once again Perkin attempted to lay siege to Waterford, but this time his effort lasted only eleven days before he was forced to flee Ireland, chased by four English ships. According to some sources, by this time he was left with only 120 men on two ships. On 7 September 1497, Warbeck landed at Whitesand Bay, west of Plymouth, in Cornwall hoping to capitalise on the Cornish people’s resentment in the aftermath of their uprising only three months earlier. Warbeck proclaimed that he could put a stop to extortionate taxes levied to help fight a war against Scotland and was warmly welcomed. He was declared “Richard IV” on Bodmin Moor and his Cornish army some 6000 strong entered Exeter before advancing on Taunton. Henry VII sent his chief general, Giles Daubeney, 1st Baron Daubeney, to attack the Cornish and when Warbeck heard that the King’s scouts were at Glastonbury he panicked and deserted his army. Warbeck was captured at Beaulieu Abbey in Hampshire where he surrendered. Henry VII reached Taunton on 4 October 1497, where he received the surrender of the remaining Cornish army. The ringleaders were executed and others fined. Warbeck was imprisoned, first at Taunton, then at the Tower of London, where he was “paraded through the streets on horseback amid much hooting and derision of the citizens”. Warbeck was held in the Tower alongside Edward, Earl of Warwick; the two tried to escape in 1499. Captured once again, on 23 November 1499, Warbeck was drawn on a hurdle from the Tower to Tyburn, London, where he read out a confession and was hanged. 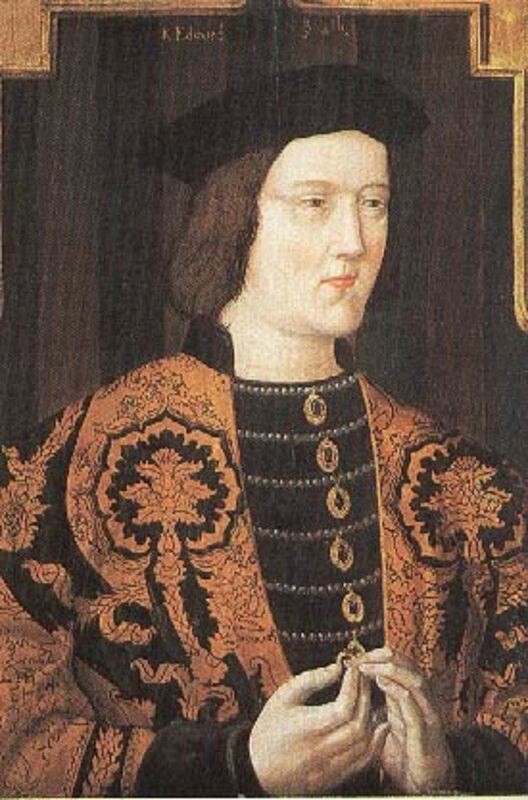 Perkin reportedly resembled Edward IV in appearance, which has led to speculation that he might have been Edward’s illegitimate son, or at least had some genuine connection with the York family. Some authors, for example Horace Walpole, have even gone as far as to claim that Warbeck actually was Richard, Duke of York, although this is not the consensus.